Home  My Gleanings Page  Illustrated Edition - Page 11. Illustrated Edition - Page 11. Proprietors of the Merchant Mills at the close of four years successful business still enjoy a good patronage and there is no doubt but that the business will continue to increase as it has in years past. In a community where there is so much time devoted to and capital invested in the culture of the two great commercial factors, wheat and corn, or to aid in manufacturing them into useful productions, there must necessarily be found a number of firms whose operations are conducted upon a scale of such vast magnitude with trade covering so large a scope of territory as to call forth more than ordinary notice. Prominent by reason of its magnitude, as well as by its far reaching arms of trade; the business of A. Dewey & Co., extends prominently in view. This firms owns the Merchant Mills, one of the finest milling plants of the entire state and has a daily capacity of one hundred barrels of flour, yet the demand more than equals the supply. It goes into the large cities and there successfully competes with the best flour made in the world. Provision inspectors everywhere remark of its purity and its merit makes it sales. Their favorate [favorite] brands are Dew Drop and Royal Patent. For this grain they pay to the farmers thousands of dollars annually and always pay the highest market price for good grain, as that is all they have any use for. They also do an exchange business so can suit all who trade with them. To run their plant requires the assistance of several men all of the time, but Mr. Dewey, one of the firm, is a practical miller himself and does not have to depend wholly on his help, although only the best of experienced and competent men are employed throughout the plant. 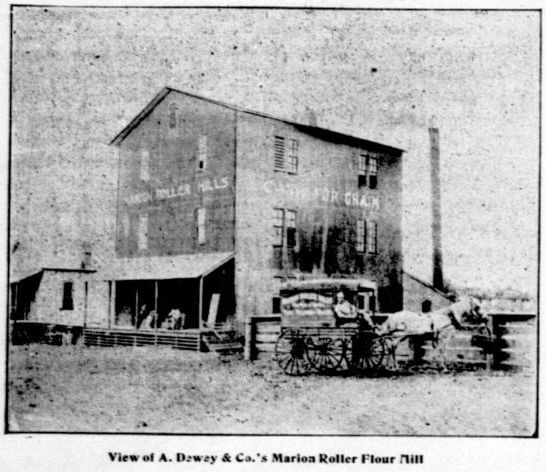 The mill is provided with all modern machinery, run by a twenty-eight horse power Allen engine, helpers who have had long experience in the milling business, so every advantage is afforded to produce flour that will be sought at home and abroad, and such favor is accorded to the product wherever it has been shipped. The main building is 33x42, four stories high, was erected by Kevil & Lamb in 1887, but it was bought by the present management four years ago, and in the last two years it has been thoroughly renovated remodeled and refitted with the latest improved machinery, so it is properly ceassed [classed] with the leading milling plants of the state. 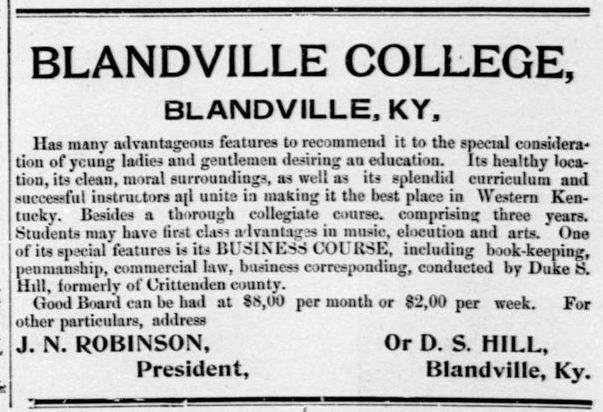 The individual members of this firm are A. Dewey, Dr. J. R. Clark and J. N. Clark. These gentlemen represent a commercial element of the city foremost among the business men in all matters of public spirit, enterprise and improvement. They are of a class ever zealous and determined in preserving to the city a reputation it so justly merits among sister cities, as one of educational prominence, social culture and unexceptionable refinement, and as business men they possess attributes of exalted principles of honor and integrity of character. Enterprising and prosperous they have ever been and the future opens bright for them. Their success has been the result of good management, not good luck, and they have endeared themselves to the consumer and the producer. As citizens they justly enjoy the respect and esteem of the public. S. D. HODGE & CO.
From its early history to the present time, Marion has been wonderfully favored with men of capital and advanced ideas, who have sought the dry goods and clothing trade, located within its precincts and through its tempting displays, and made it a mart where dry goods are dispensed in volumes that would do credit to much larger cities and brought to its doors a trade that is far-reaching and steadily growing. In this respect S. D. Hodge & Co., must have place as leaders, for their enormous annual sales speak in terms more elegant than are at the writer's command. The individual members of the firm are S. D. Hodge and R. E. Bigham, both men of superior business qualifications, and marked executive and financial abilities, such as are destined to lead successfully an important mercantile life. 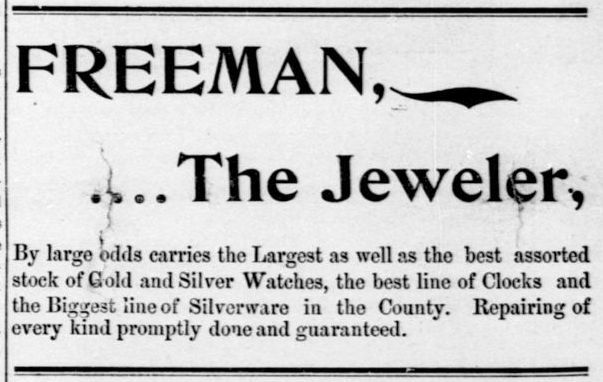 Their store building is 22x80, beautifully finished in hard wood, and made attractive by tasteful decorations and as ten thousand stock in fine display. They carry dry goods, clothing dress goods, boots, shoes, and etc., the very best of goods that can be bought in the best wholesale houses of the north and east, in variety and quantity sufficient to give a choice to the most exacting and fastidious. Mr. Hodge is a native Kentuckian and been for ten years in the mercantile business and received his schooling from J. N. Woods, the merchant of Marion who has sent from behind his counters into the active business world scores of men whose success has been imminent since they opened their business to the public, and Mr. Hodge's success has been exceedingly flattering. A good business and large patronage were his at once and his treatment of both has made him a very popular merchant and his partner's experience and good management have done their part toward building up a solid business, whose foundation was fair and square dealing. Mr. Bigham is the book-keeper of the firm, a quick and accurate accountant and a man of honor and integrity. 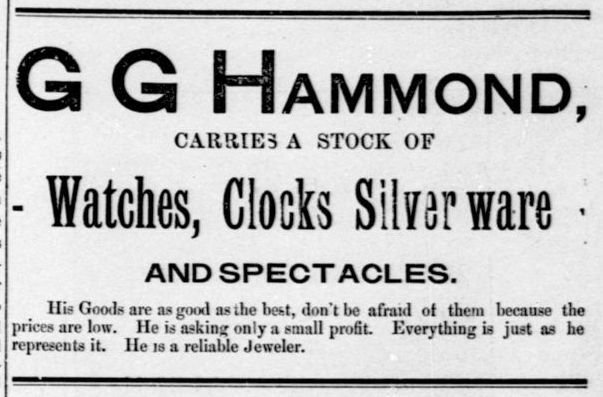 S. D. Hodge & Co., have gained a fine reputation as dealers in clothing and have just opened up a stock to which they respectfully invite attention. These suits are made from the most fashionable cloth, cut in the latest styles, so you can not fail to be suited and they guarantee to fit you perfectly. They can fit you out in a good business, traveling or dress suit in this department and any department of the store is equally as completely stocked. 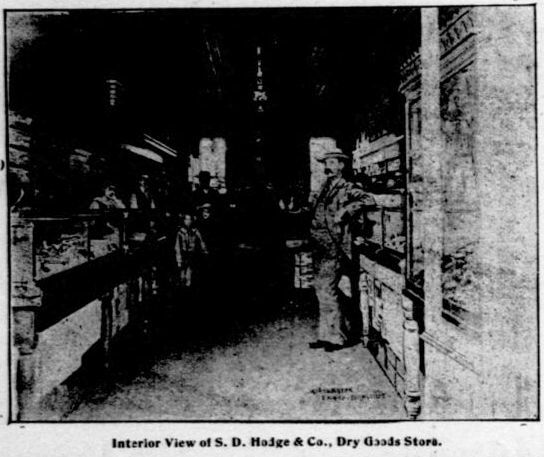 The people of the city have learned to place implicit confidence in the proprietors and employes [employees] of S. D. Hodge & Co., and have the best of assurance that it will not be betrayed. 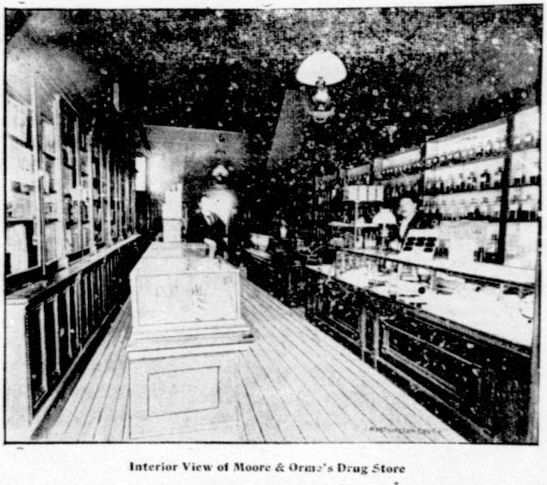 The drug house of Moore & Orme is a leading establishment of the city, and the proprietors have shown from its incipiency that no pains were to be spared in placing it in the front rank. The store-room is beautifully finished in oak and the presc[r]iption case is one of the most complete in appointment of any we have ever seen. The business is as solid as oak, but the growth of the business has been exactly the opposite of that slow growth timber. Mr. Moore is largely engaged in othor [other] business, as he was a practicing physician for fifteen years, is an ex-president of the Marion bank, and is now a candidate for railroad commissioner. J. H. Orme is a registered pharmacist, of five years experience, a graduate of the Vanderbilt University, and has been in business here for the past three years, and to him is left the entire charge of the establishment. 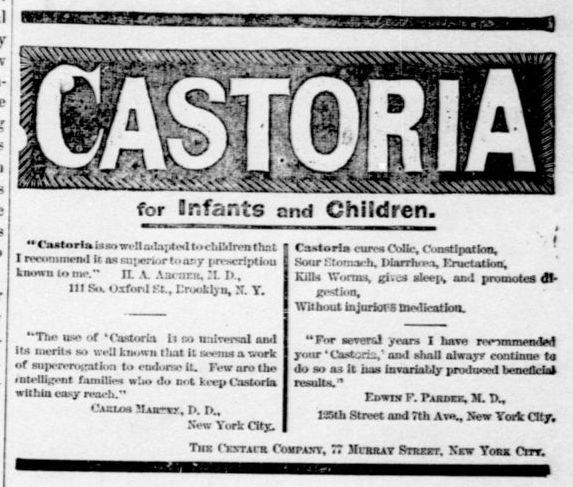 The druggists profession, while among the most attractive, is at the same time one of the most responsible callings; a druggist must, of necessity, possess much knowledge of the service be painstaking, careful and reliable. The confidence reposed in the skill and knowledge of a druggist, in constantly entrusting our lives in his hands speaks louder than any encomiums. Among these in Marion none enjoys more implicitly the full confidence of the people, and justly, too, than Mr. Orme, whose business premises are the next door north of the Barion [Marion] Bank. Since he began business here he has had no reason to regret locating in Marion, and under his able and efficient management the house will ever be signally successful and prosperous. The stock of drugs is large and complete, so no one ever calls for anything in the world of medicine that is not to be found and of a good quality, kept fresh and pure. Mr. Orme will not use or sell an article that does not answer the requirements, as he values too highly the patronage of every customer to hazard it thus. Then he is a man of exalted principles and business integrity. 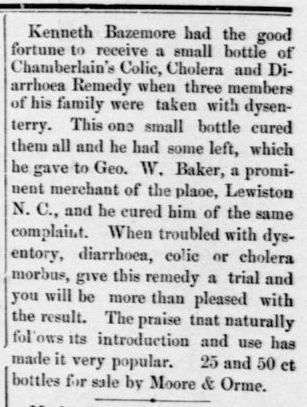 Pure drugs and drug sundries make the body of the large stock, yet he has complete lines of the standard patent medicines, stationery, blank books, fancy toilet articles, perfumes, and the books of standard authors, also the popular books of the day. The fine stock of tobacco and choice cigars have attracted the users until it is quite popular to smoke the Moore & Orme cigars. Every line is full, and the entire building is filled with goods of a superior quality. The Mastic paints are kept in all colors and shades. The specialty is prescriptions, and every prescription that is laid on his case is carefully compounded, the ingredients pure and fresh, and the exact quantity called for is used. Taken all in all, this is one of the handsomest store-rooms of the city and the stock will stand any comparison. Mr. Orme has his intelligence, knowledge of details and close application to business duties to thank, not only for his business success, but these attributes, coupled with courtesy and attentive care to the demands of his large patronage as well, to the high estimation and confidence he enjoys, at the hands of Marion's good people. There are many things for which the city of Marion is justly famous, and one of its prominent features is the magnitude of its mercantile houses, for in this she rivals many larger towns of the State. 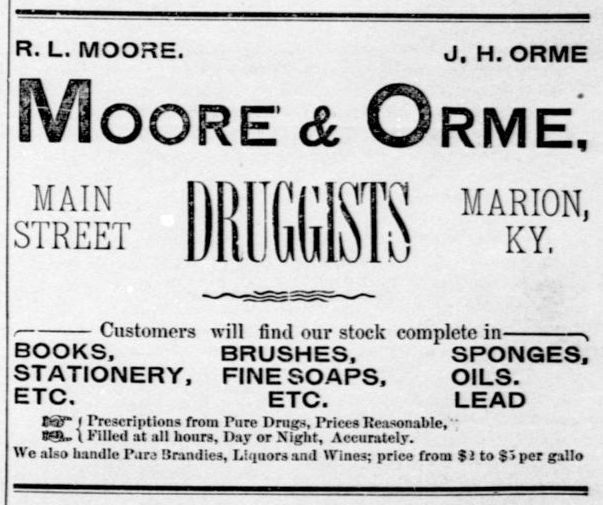 Foremost among our solid business concerns is the mercantile establishment of J. H. Morse. Mr. Morse was born in Caldwell county, Kentucky, in 1863, and spent his early life on a farm. He started in business for himself with a capital of brains and energy, which have by their proper use surrounded him with the comforts of life, nor are the luxuries debarred. While he was poor even for that time, he was rich in the possession of energy and business qualifications. He was for six years engaged in the tobacco business at Shady Grove, when on closing out there three years ago he moved to Marion and opened up this large retail house. His business daily increased, and J. H. Morse commenced taking immense strides in business affairs that has placed him in the ranks as a prominent business man. He has put in a large, carefully selected stock of dry goods, boots, shoes, notions, hats, caps, clothing, and makes a specialty of ladies shoes and dress goods. In buying his goods he pays cash, gets the best discounts, and so is able to sell lower, as he sells for cash only, and does not intend that his paying patrons shall pay uncollectable debts. Thus low prices are made on every article of merchandise, and it is one price to all, so the prices are eminently satisfactory to all. In this department we found the ladies drawn as by a magnet, by the low prices and excellent quality of the goods, at the same time looking at the goods, chatting good-naturedly over the caprices of Dame Fashion; ordering dress patterns, of the latest fabrics, beautiful trimmings that match exactly, and carrying their parcels away with a satisfied air, confident that they had the latest thing in both goods and trimmings, for Mr. Morse has long since proven that he buys only such goods as give the utmost satisfaction. Mr. Morse carries a $12,000 stock of goods filling his fine two-story building, 22x80, with a choice of stock in excellent display shape. He has two polite clerks, who render him valued assistance in waiting on his numerous customers. Mr. Morse is quite an inventor and has patented a button exhibitor, ribbon case, and a rack for kitchen utensils, all of which are unique in design, useful and ornamental. Marion numbers him with her live, progressive citizens, and he is an honor to the town of which he is a citizen. Was born in Gallitin [Gallatin] county, Ill., August 24, 1847. The same year his father moved from Illinois to Dycusburg, this county, and the year following he settled on the farm four miles from Marion, where he now lives. 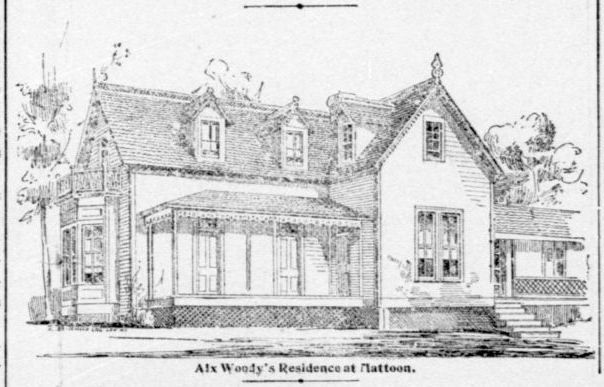 Here J. C. Elder Jr., grew up on the farm, and when nineteen years of age, he began clerking for D. Woods. 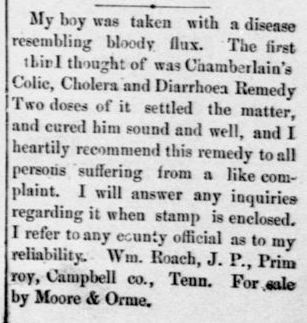 He was with Mr. Woods five years, he then clerked for J. McKee Peebles, of Shawneetown and later for Shiller & Hall, Lebannon [Lebanon], Mo. 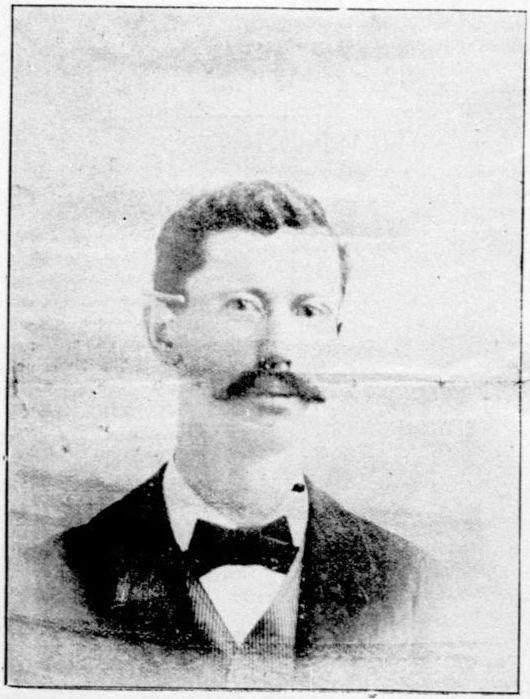 In 1880, he embarked in the tobacco business with Walker Wilson & Co., at Marion, and in 1883 he succeeded to the management of the firm, and later he purchased tobacco for himself. In 1877 he made a memorable race for county clerk of this county. He was the Republican nominee and J. W. Bigham, now the well-known minister, was Democratic opponent. After a warm canvass Mr. Elder was defeated by only two votes. He was educated at Shawneetown, Ill., and graduated from the Commercial College of Poughkeepsie, N. Y. An effort is now being made to organize another bank at Marion, and it is understood that the position of cashier will be tendered Mr. Elder, if the bank is organized. 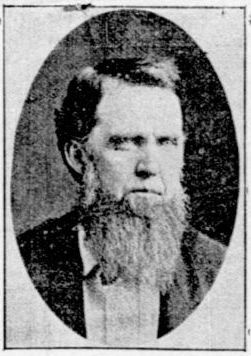 He is an active member of the Presbyterian church, and for years served his party as chairman of the county committee. Is a Kentuckian, born and raised in Marion, and it was here he was educated and here began and has continued his law practice. He began studying law with Dan H. Hughes in Morganfield, Kentucky, and was tutored by some of the ablest minds of the age. 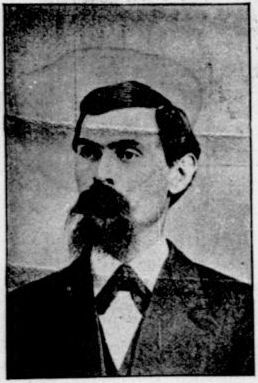 In 1878 he entered upon the practice of his profession, taking at once a commanding position at the Crittenden county bar and leading an active political life in the fold of the Democratic party, of which he has always been an active member. His career has been fraught with the greatest success. He has held some of the most important public offices within the gift of the people of his county. He was twice elected county attorney, entering the office when only twenty-seven years of age, being the youngest man ever so honored in Crittenden county. Three times has the Democratic party placed him in positions of thrust and thrice has he discharged his duties honorably, with an earnestness of purpose and uprightness deserving of distinction. He is now a candidate for County Judge and is fully capable to fill the place to which he aspires. His has been a long, successful legal experience, one which has particularly fitted him for county judge. His law practice has been a general one, commercial and corporation law and he represents several prominent collecting agencies. It is as a lawyer he has achieved his greatest celebrity. In his office in the Carnahan Block he is surrounded by an elegant library, the latest decision and reports and thoughs occupied is never too busy or tired to talk and execute business. He has a large acquaintance over the county and numbers his friends by the score. Plain, unassuming, pleasant and social he lives near the people. In all the relations of life he is admired, and he has been true to every trust, and has demonstrated beyond cavil his ability to fill with honor any office within the gift of the people. When the time came for selecting a candidate for county judge this canvass, all eyes naturally turned to him. Remembering the gallant fight he made four years ago, his party did not hesitate to trust him again. If elected he will make a splendid official, if defeated he will continue the good useful enterprising citizen and honest, true and faithful friend. 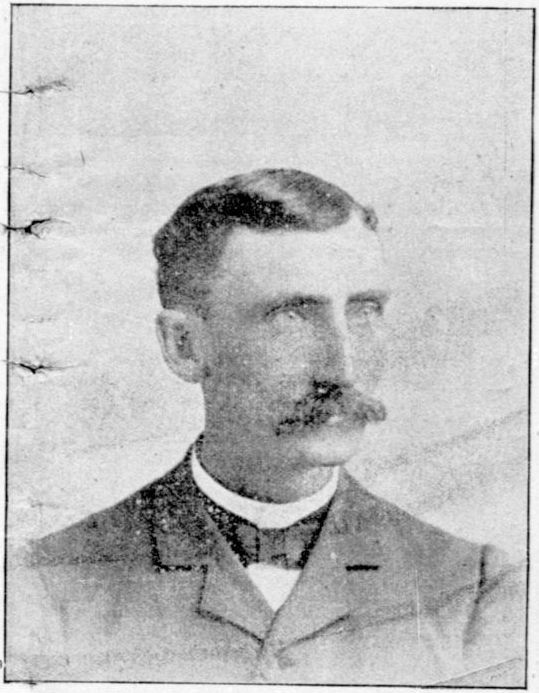 The gentlemen [gentleman] whose name and picture appears above is one of the very few gentlemen, now living, who has been [connected] with the affairs of Crittenden county almost since it was a county. J. H. Walker was born in this county Nov. 14, 1827. He worked on a farm until he was twenty-four years old. In 1851 he was appointed deputy sheriff of Crittenden county under M. B. Haynes and served until 1854, in which year he was elected sheriff, and re-elected in 1856, serving four years. In 1862 he was elected circuit court clerk, and re-elected in 1868, serving as clerk twelve years. 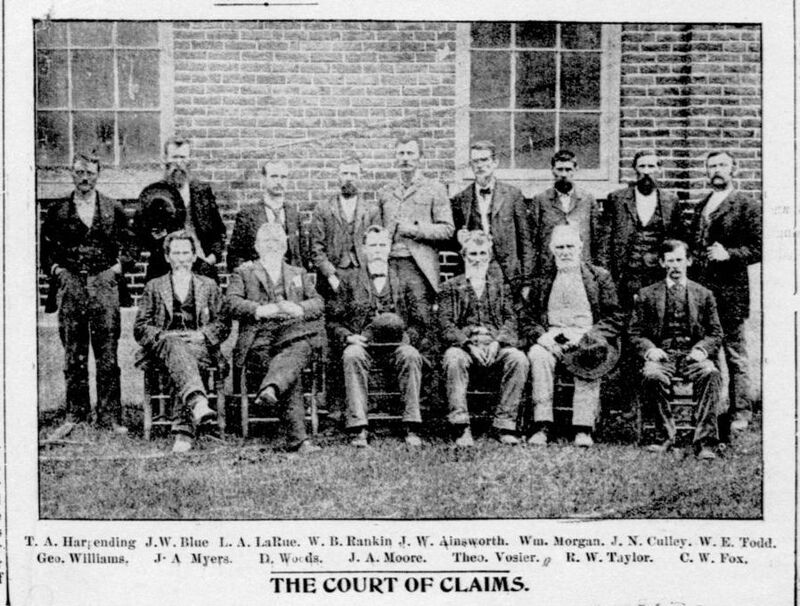 In 1879 he was appointed master commissioner and trusty of the jury fund, which offices he held until 1894, thus serving the people of Crittenden county thirty-four years in various official capacities. In every office he served faithfully, making an official record without spot and without blemish. He has the best memory of any man living in Marion, and from his vast store house he can call up names and faces unknown to a majority of the present generation, and relate incidents that occured [occurred] three, four, five and even six decades ago. He is never at loss for a date, and when the name of the old citizen is mentioned he can associate it with pleasant things that occured [occurred] years ago. His gray hairs, venerable figure, and active mind attract the attention of all strangers who come to Marion. When Crittenden's history is written, J. H. Walker's name will occupy a prominent and honorable place in it. Source: Crittenden Press. 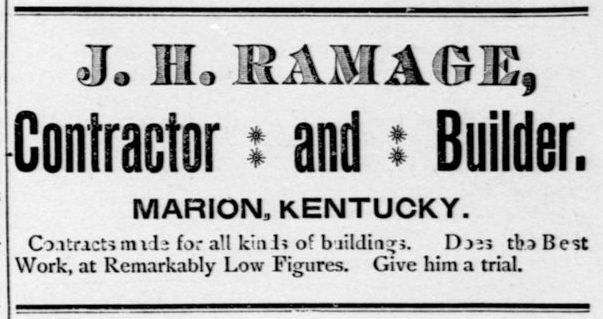 (Marion, Ky.) 1879-1907, August 16, 1894, Image 11 - Chronicling America - The Library of Congress.